Nutritional supplements marketed to athletes is a big market. Just like food fads, different supplements go in and out of fashion. Some are approved by the FDA and other governing bodies, while others are not regulated. It is always important to consult your doctor before adding any supplements into your dietary regime. With that said, I was curious when ARK Nutrition contacted me. 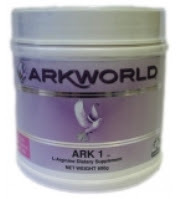 They offer ARK1 ("the pink drink"), ARK2, and Xcell purple pills (ARK3). We agreed that for a proper test, I would try out their products for 30 days. I went with ARK1 and Xcell pills. When Ark Nutrition originally reached out to me, I received their info about what the products would do for me. However, I have not looked at them since then until now. Claims for Xcell: The product works as an anti inflammatory supplement thus assisting the body to repair and recover from training and exercise much faster. Due to this property the product can again help in a medical sense with inflammation of joints in arthritis suffers or deal effectively with injuries and muscle repair for instance. Some people have reported that their muscle recovery after intense lifting sessions is much faster than when not using this product. Some go on to say that Delayed Onset of Muscle Soreness (DOMS) is drastically reduced and in some cases removed altogether. ARK1 tasted a little like bubble gum at first (they describe it as tropical flavor). Honestly, I wasn't sure if I would be able to get passed the taste and continue the trial. However, after about a week, I came to enjoy it (especially when I diluted it to the correct ratio). I took it once a day while at work (label says to take 2x/day). Because it contains sugar, I usually didn't have a second serving after 7pm so my sleep patterns weren't interrupted. With ARK1 I felt energized throughout the day and didn't require my occasionally afternoon Diet Coke. I also lost about 5 pounds and 2% body fat. For full disclosure, I did add additional strength training and an additional indoor cycling session to my weekly routine during the trail, so I am not sure if the chicken or egg came first. Two weeks after I started the AK1, I began taking the Xcell pills. I delayed this because I consulted with a dietitian on whether the Xcell would interfere with my daily diet and vitamins (I take daily vitamins, iron, folic acid, and aspirin for various reasons). The biggest thing I noticed with Xcell is that I wasn't sore the day after big workouts (such as my long runs or sprint triathlon) or even my conditioning sessions. 1. Being a science nerd, I love that Exeter University has done a study with ARK Nutrition and found positive results about the product. 2. HFL Sports Science certifies each batch. 3. The World Anti Doping Association also certifies each batch. If you are a competitive athlete, this is very important! For me, I saw the results ARK Nutrition promised their products would give me. It was easy to incorporate the pink drink and purple pills into my daily routine too. It is important to do your research when selecting supplements, and as I said before, talk to your doctor before starting a new regime.